Nice find Jack, I have solidly abused my w&n s7 for a good 2+ years now, so they are nearly ready to be replaced (yes, for those reading: that's how long these brushes last!). 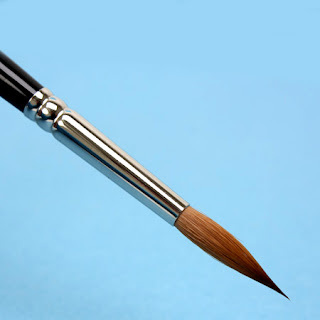 I primarily paint with a size 2, until I get to the last couple of stages of hilights and fine detail, at which point I swap out to a size 1 - you dont need to go as small as with other brushes, as these hold such quality points. Would they be any good for painting the deck? I'm not sure you'd get any use from them unless your eyes are actually able to focus on the tip, so I'd give it a miss. Thanks, my painting needs all the help it can get. On a related note an article about airbrushes (specifically which ones are good/where to get them in NZ) would be awesome. I'll mostly leave that one for Charlie to do properly, since he's now the resident airbrushing expert. I'll do an airbrushing article (though I think it will need to be a series) in the coming days, as I really do see a lot of value in them, and as you get more and more used to them you can start to do some amazing things that not only save time, but you can do things you could never do with a hand brush. It's not the magic bullet many people want it to be though, it is at best another tool, but one with a far far steeper learning curve. There was one recently on Thrallblacks which was good. Same model compressor as Charlie and I have. You can get the Raphael 8404's in NZ (both standard and miniture/touch up) from your local art supply store. Just ask them to order some in if they dont stock them. There is an importer/distributor based in Auckland.